The rain's so heavy that it looks like nightfall outside, and it's only the afternoon. We have to go out in that later as we're going to see Bryn Terfel. That stuff's tropical intensity and when we went out for brunch this morning, there was already flash flooding. It won't be sandals tonight, then. And now it's turned into a thunderstorm. Lightning makes me (a hill dweller) nervous. Anyway, I had to take some books back to the library on Thursday and was surprised to see a small Star Wars Lego exhibit, probably because it's school holidays. Two photos, not that good as they were taken with my phone. 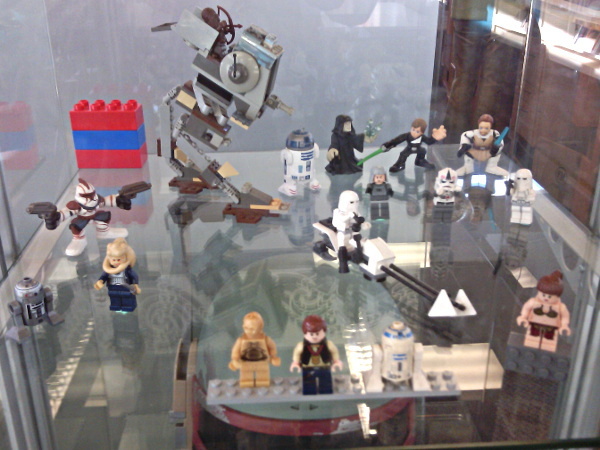 Little Lego figures and a walker I'd like to make. 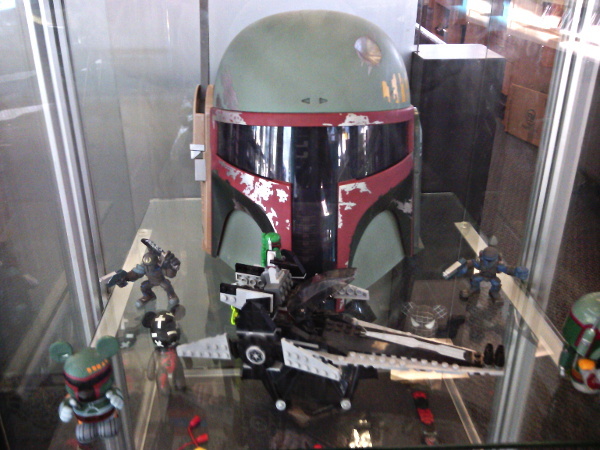 More, along with a full-sized Boba Fett helmet. I'm not sure why Boba Fett has Mickey Mouse ears in the bottom left. Now I've finally sorted out Google Plus photo hosting, I should get round to posting more pics.